Galerie de la Marine is pleased to announce Temps Suspendu [Suspended Time], Elias Crespin’s first exhibition in Nice. Questioning the relationships between art and science and rooted in geometric abstraction, Elias Crespin’s artistic universe falls within sculpture and new technologies. His mobiles are a corpus of simple shapes forming a slow aerial choreography. Made of metal or plexiglas they are powered by small motors controlled by a computer program designed by the artist. For this occasion, Crespin produces a monumental piece, Plano Flexionante 4, a huge wave of 32 metal rods unfolding in the space. Three other mobiles will complete the set: Malla Electrocinética I, his first work, Circuconcéntricos Blanco P/A and, finally, Circuconcéntricos Fluo Bleu, which will be on display immersed for the first time in Jacopo Baboni-Schilingi’s musical environment, specifically composed for the show. 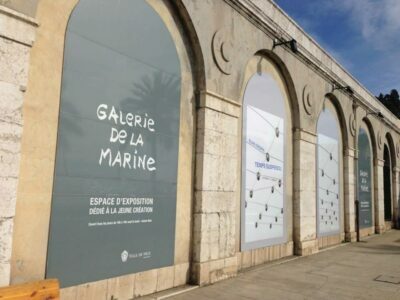 Since its opening in 1967, Galerie de la Marine offers an exhibition program focused on contemporary art, showing young artists emerging both on the national and inter national artistic scene.